Developers of senior living facilities see the convergence of favorable demographic shifts and strong economic conditions as providing an opportunity they can’t ignore. As a result of the availability of cheap debt and favorable financing, they’re building facilities today for the demand that will come over the next decade as millions of baby boomers hit retirement age or older. The same group of people who are living longer than previous generations also are looking for a variety of housing options and amenities in their golden years, according to developers and contractors. The savvy organizations taking advantage of the current conditions hope to avoid getting caught short when the wave of retiring baby boomers really begins to hit in the coming years. The Grand Rapids-based Beacon Hill broke ground last month on a $30 million expansion of its Eastgate community on Boston Street on the city’s southeast side. Huegli said the expansion offers several examples of how companies like Beacon Hill are reacting to the changing behaviors of their residents. Beyond the 56 new residential units, Beacon Hill’s expansion focuses on providing residents with expanded dining options and facilities. The 18-month construction project also includes amenities such as a 200-seat auditorium, Huegli said. As this story went to press, most of the units had been pre-sold, according to the company. Beacon Hill tapped Dallas-based PRDG LLC to serve as the project’s lead designer, and Grand Rapids-based Progressive AE provided landscape design services. Rockford Construction Co. of Grand Rapids is serving as the project’s general contractor. Organizations such as Beacon Hill realize they must react to a massive demographic shift. By 2050, the U.S. population will have a projected 83.7 million people aged 65 and older, more than double the number in 2012, according to recent Census data. Because of that dramatic increase in the number of retirement-age people in a couple of decades, developers and general contractors see a window of opportunity for companies to build now while taking advantage of low interest rates, said Ben Wickstrom, president of Ada-based construction firm Erhardt Construction Co.
“The baby boomers are coming so (senior living) will continue to be a solid market going forward,” Wickstrom said. For more than 25 years, Erhardt has generated a substantial part of its book of business by building senior living facilities, he said. In some years, the sector has accounted for as much as 15 percent of Erhardt’s business, but it varies greatly from year to year, he added. The same trends that Beacon Hill cited in expanding the Eastgate property also factor in to other senior living developments and expansions all across West Michigan. For example, Holland Homeexpects to invest about $6 million to renovate and expand its Breton Woods campus in Kentwood, a project involving Erhardt Construction. The expansion consists of a new 4,560-square-foot rehabilitation center and a 13,390-square-foot, 15-bed memory care assisted living unit. Elsewhere, Southfield-based architecture firm Edmund London and Associates Inc. anticipates a fall opening for a $14 million, 158-unit independent and assisted living facility known as StoryPoint that it’s developing on 10 Mile Road NE in Algoma Township. More people have also started to consider a move to a senior living facility now that the economy has improved and their home values rebounded, according to a March 2015 report by Marcus & Millichap Real Estate Investment. “Now that some normalcy has returned to the housing market for the first time in many years, a wave of seniors are financially and psychologically in a position to transition into some form of senior housing,” the report said. The California-based real estate firm noted in the report that low interest rates factor into the growth equation for senior living projects, which are starting to draw investors who have normally put their capital in other areas of the commercial real estate industry. Historically, assisted living facilities don’t generate the same level of interest as traditional multifamily housing from institutional investors such as Real Estate Investment Trusts (REITs), the report said. That could change, however, as industry watchers believe REITs could invest as much as $30 billion in the senior living market this year. 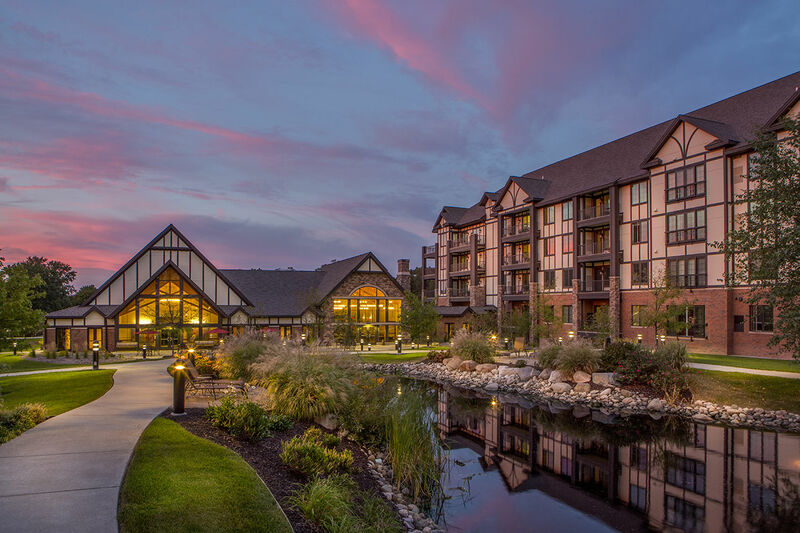 Indeed, in the second quarter of 2015, Irvine, Calif.-based Griffin-American Healthcare REIT III Inc. acquired the six-property Mountain Crest Senior Living Portfolio, which includes a community in Niles in Southwest Michigan. The acquisitions were part of a multi-state deal for an aggregate purchase price of $311.3 million, according to the company. For the Eastgate expansion, Beacon Hill used financing from two banks, Huntington Bank and First Midwest Bank, as well as issued public bonds. The combination of loans and bonds allowed the company to restructure its debt and obtain low-cost financing, Huegli said. Much like new multifamily housing and office projects, developers of senior living facilities realize they are building for a whole new generation. That means spaces must be designed with flexibility in mind and units must accommodate a wide variety of people and uses — not to mention they have to include the latest in amenities. In the future, Beacon Hill may build smaller communities designed with more of a neighborhood feel, he said. That’s a sentiment shared by Erhard Construction’s Wickstrom, who noted that amenities ranging from high-end, on-site food options to gyms and swimming pools would fit in at upscale housing developments. Developers must also place a premium on good design as they prepare for future growth and build spaces that must be relevant decades down the road, sources said.